Compatible with devices having #8-32 or M3 taps 1.50" or 1.75" o.c. Tired of waiting for custom brackets to be fabricated? This light bracket will expedite installation and return your equipment to full operation more quickly. This aluminum bracket is typically used to mount machine vision lights and code readers on a 1" rod. It will mount most devices having #8-32 or M3 tapped mounting holes located 1.50" (38 mm) or 1.75" on-center. Examples include our LTSN52_ lights, and Omron Microscan ID-30, ID-40, and ID-45 code readers. 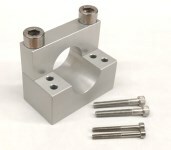 This bracket has been tested for compatibility with our rods having a nominal 1" outside diameter. Machined for a precision fit, rods sourced elsewhere may or may not work. Most lights have mounting holes at both ends, so please order two kits if necessary. Stainless steel socket-head cap screws included: two M8 x 30 mm, two #8-32 x 1-1/4", and two M3 x 30 mm.